Oz the Great and Powerfull Full Triptych Now Complete!!! The last Poster for Oz the Great and Powerful is now released and forms the whole Triptych piece. Behold the new poster after the jump. I remember that I revealed last time that the Wicked Witch on the left is Evanora (Rachel Weisz). But with the last piece revealed, it confuses me now who is this 4th witch. My theory is it is either Evanora or Theodora(Mila Kunis) on a different form. Of course it is highly unlikely that it is Glinda (Michelle Williams). Maybe this is one of the film's main mystery. But if we will follow what is obvious on the trailers, our best bet for the film's baddie is Evanora. Oh well, let's see. We don't really want to know that now right. So let's just wait for next year when this question is answered by the film itself as it premieres on March 8, 2013 in Philippine cinemas. 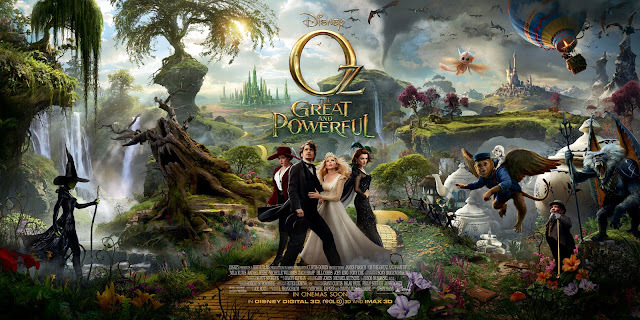 Oz the Great and Powerful is directed by Sam Raimi, to be distributed by Walt Disney Pictures.